Successfully Added Vgate iCar OBDII Car Diagnostic Reader - Wi-Fi to iOS/Android/PC to your Shopping Cart. Vgate iCar OBDII Car Diagnostic Reader is a fast and efficient way to self diagnose problems with your vehicle’s engine and it also has Wi-Fi for connecting Android, iOS or PC devices. 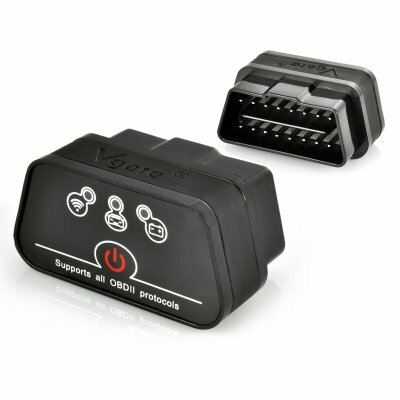 This is the Vgate iCar OBDII scan tool, which is a high-quality automotive scanning tool that supports all OBD-II protocols, including SAE J1850 PWM(41.6K baud), SAE J1850 VPW(10.4K baud), ISO9141-2(5 baud init, 10.4K baud) as well as USER2 CAN(11 bit ID, 50K baud). Tthe Vgate iCar OBDII scan tool allows for you to self diagnose issues with your vehicle therefore you will know what needs to be done next time you visit a mechanic. You connect the Vgate iCar tool to your car’s OBDII Cable via the plug’s 16 pin interface, and once connected the iCar scan tool will never have to be unplugged. As it uses Wi-Fi, you have a stable wireless connectivity range of around 10 to 20 meters. In addition it does not require any wires or batteries since the adapter is powered by the diagnosis socket. The iCar scan reader uses the fastest and most reliable ARM chips; consequently your results will be delivered swiftly and correctly. This car diagnostic scan tool has the capability to read trouble codes, both generic and manufacturer-specific, along with display code descriptions with over 3000 universal code definitions in the database. Furthermore the Vgate iCar OBDII car code reader can be used with a PC, iOS or Android devices where the user can download the appropriate app from either the Google Play store or Apple’s App store.. In stock now, we guarantee that this OBDII Car Diagnostic Reader can be dispatched within one working day with a 12 months warranty. Brought to you by the leader in electronic devices and wholesale car disgnostic reader, Chinavasion. To use with Android, please download the TORQUE app from the Google Play store. Torque is an OBD II performance and diagnostic tool for any device that runs the Android operating system. It will allow you to access the many sensors within your vehicles Engine Management System, as well as allow you to view and clear trouble codes. To use with iOS, please download the Dashcomman app from the App store. Works exactly as described. Many widgets available for the software. Very informative.